Gloria is a middle aged woman. She is divorced and has two children who have their own lives. Gloria is a funny, smart, and independent woman. Even though she is 58 years old, she still feels young, and is ready to fall in love again. She loves to dance, and with her incredibly charming look and liberated personality she attracts the attention of others, mostly men. And that`s how she meets Rodolfo, a sixty-something who is also divorced. They both will forget about everything as they find that life, love and their young spirit is all they will need to fall in love again. Before you begin watching Sebastián Lelio’s “Gloria, with a knock-out performance by Paulina García, ensure you acquire a different point of view from the one you might have. You might find the premise hard to accept, but that does not mean it can’t be true. The question is- will you be able to accept the truth? With an absolutely incredible script, where every single nuance was described the way that Hollywood would have never have accepted because European films have a different vision and a different style that does not come from Hollywood. But let`s get back to ‘Gloria’. As the movie opens, we find Gloria in a dance club with Donna Summer`s “I Feel Love” blasting away. Donna Summer`s song exactly describes the mood of Gloria, who is still looking for romance and even at her age and I see no reason why she shouldn’t. Gloria works and earns enough money that she doesn’t have to depend upon her ex-husband. She frequents a nightclub where she likes to drink and dance and hit on men around her own age. One of those nights, she meets the gentle Rodolfo, who is also divorced, but is still largely involved in the life of his ex-wife and their two daughters. But as life goes on for Gloria (Paulina García) and Rodolfo (Sergio Hernández), they decide that they have a right to live their lives as they want. But, Rodolfo`s emotional attachment to his family, does not allow him to fully enjoy his newfound love with glorious Gloria, who is willing to give away the most precious thing she ever had – her freedom- to a man who is so tender and gentle. It`s hard to imagine how this film would look if not for the magnificent performance of Paulina García, who delivers an incredible performance. Every time I see Paulina dancing in the club, or talking with her lovely kids, or doing anything, I can see how well she studied her character, Gloria. This is what fascinates me about this film. Even though, we have to see all those drama, love scenes between Rodolfo and Gloria, and cheer for them, but mostly, for Gloria, who actually the one, that the whole film centered around. The screenplay is admirably unpredictable with the ups and downs that happen in life. 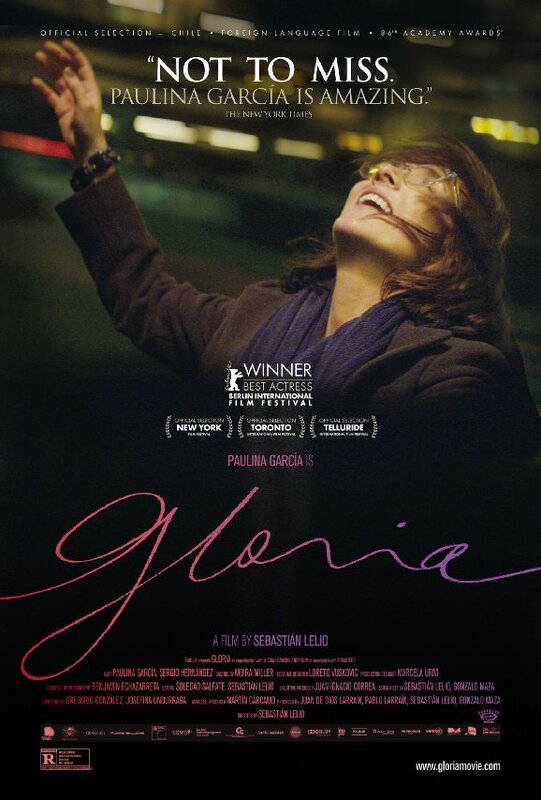 “Gloria” may remind you of a romantic comedy, but it`s not since the realities of her life and her loneliness are much stronger than the funny scenes, that will make you cry more than smile. But this is the life of Gloria; a fee-spirited woman, who does not want to make her journey alone, but wants you to join her, to share her happiness with you. She wants to show you how to live your life at any age and that life is the most precious thing we have. Gloria knows how to do this as no one else does.